Working with a client recently they shared with us their NPD projects; 142. Wow, ‘142 projects’ we said. Yes, and they were all captured, managed (To more or less extent), and progressively nudged forward. They’d missed prioritisation. As an outsider it’s obvious to see what they had missed and your reading this thinking …too many projects, and they need a pecking order. Yet, so often we just cannot see the wood for the trees when we are under heavy fire, and working with the big 4 UK supermarkets is heavy fire, as you know. So, the Question is….How Prioritised are Your NPD Projects? Using our Category Management Executive Coaching we ask the client about their NPD projects. They are open to sharing the projects that they have on the go. Then they begin to justify each and every project. We understand JFDI’s. The challenge is about whether the energy is focussed in the right areas to get the biggest return. Your NPD team has a lot of projects and more and more are coming in. Great news, because they are a sales stream. Yet, it could return more. Time and time again we see EPD/NPD projects all treated equally. And usually because the NPD team have been given a brief with no estimated sales/profit numbers. So, unsurprisingly they work on them equally, not knowing how to priories, even if they wanted to. List all your NPD projects. Maybe in Excel. Next to each project, write an estimated sales number. A value per year. For each project now put a difficulty number against each. A number that, drawing on your experience, reflects how much hassle it will be to launch this project in-store. Include your company time & effort, how ‘unusual’ the skus are for the factory, and how likely it is to be launched. Use a 1-10 scale, with 1 being easy to launch and 10 being very difficult to launch. Grab a piece of paper (a piece of Flipchart paper will be best) and turn it to landscape. 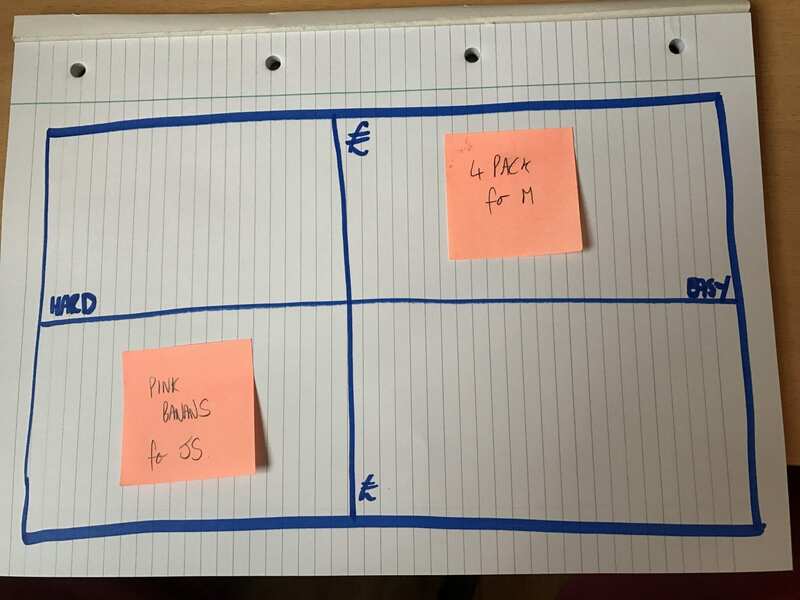 Now write each project on a post-it note and place it on the Flipchart using a Boston Matrix. The image below will help. There are two axis. The horizontal axis shows the degrees of difficulty; on the right is easy to launch and on the left is hard to launch. The vertical axis is money. At the top is high money and at the bottom is low money. Starting with the top right box. This is box 1. This is where the ‘easiest to launch’ projects are located and those with the highest amount of money. These are you biggest potential sales. The challenge is to make these even bigger; How could you make these projects even bigger? More sku’s? More distribution? An introductory offer? Better quality? Cheaper? Larger packs? It is worth brainstorming. Our brainstorming techniques will help you. The take away here is ‘Focus and make them bigger’. The top left box is box 2. 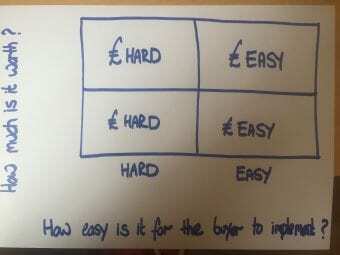 Hard-Difficult to launch and high Sales. The challenge here is whether they are worth launching. Will the effort required to launch be worth it? How could you decrease the effort needed to launch? Or should they be deleted? The take away here is ‘How could they become Box 1 projects?’. Box 3 is the bottom right box. These projects are in the ‘easy to launch and low money’ box. These projects need minimal effort, so just get them launched quickly and move on. The take-away here is ‘No fuss and quickly’. Our last box is box 4. Difficult and small value. The challenge here is simple to say, and yet hard to do. ‘The takeaway is ‘How can you get rid of these?’. Some will be JFDI’s, and others not. The latter projects need a very good reason to remain. Step 1: List the projects. Step 2: Add an annual sales value next to each. Step 3: Add a difficulty value. Step 4: Place the projects onto a Boston Matrix. Step 5: Work through each box identifying where to put your efforts and where not to.